Beautiful life... beside the beloved...: I need another breast pump.. So the extra pump to be used only at home. 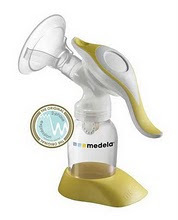 I have decided to buy Medela Harmony brand from http://harlindahalim.blogspot.com . Lyn the owner of that blog was sell it for RM200. I think, it quite cheap if compared to breastpump accessories shop. And also buy car sticker for only RM5 .. if not the sticker price is RM10. hehhehe.. TQ lyn..
Can't wait to get that breastpump... happy pumping sri.. dont be lazy to wake up at night to give and to do the best for Fahri..
ku teringin nak try avent isis ni tapi cam cofuse la nak pilih yg mana..